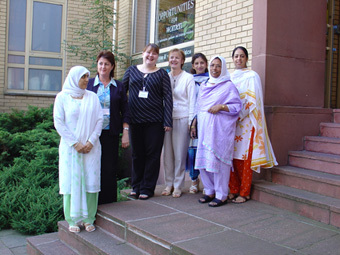 Opportunities for Women Ltd Staff Members (from left to right): Noreen Mirza, Rebecca Dean, Sarah Bell, Lesley Williams, Habidah Usman, Shamima Ahmed and Sameena Mahmood. European Social funding, initially matched with funding from OTEC, now matched by bodies including Greater Manchester Learning and Skills Council, local SRB initiatives, New Deal for Communities, Oldham College and IAG Partnership enabled the founding of the Opportunities for Women Centre in August 1991. Since then, the Centre has grown from strength to strength and has built up a reputation for being in the front line of developing a range of initiatives for women. Opportunities for Women is a centre based in Oldham which offers a combined service of guidance, information and training to any woman in Oldham seeking to return to work. It offers independent information and guidance in the areas of training, education, employment and self employment. Recognizing the fact that women have multiple responsibilities, the centre also offers up to date information on areas that affect back to work plans such as childcare provision, finance, job search skills, self employment options, local business support agencies and a host of other multi-media format resources. The idea behind Opportunities for Women goes as far back as 1990 when Ryan and Vause Associates (Cari Ryan and Ann Vause the founders of RVA Opportunities for Women now renamed to Opportunities for Women Ltd) carried out a study on behalf of the then Oldham Training and Enterprise Council, into the barriers facing women returners in Oldham. The study revealed, among other things, the need for a focal point through which women could access unbiased guidance, information and back to work training. Opportunities for Women offers a range of programmes for women returners who are aged 19 years or older, who are not in full time paid work and want to build up their confidence, knowledge and skills to prepare for future paid work. The main and most popular programme Opportunities for Women offers is the Women into Work Discovery Programme. It covers Personal Development, Job Search Skills, Planning for Progression, Discover Information Technology and Adult Direction Assessment. Women into Work Discovery Programme covers - Personal Development / Job Search Techniques / Planning for Progression / Discover IT. All training programmes are free and financial support towards childcare and travel costs is offered. All the training programmes are holistic, in that they acknowledge the multiple roles that women play. Programmes include personal development, progression into employment and further training routes, computer training and guidance. In addition the Centre has a comprehensive range of books, tapes, computer programmes, directories and guides that women can borrow. All programmes lead to an accreditation. The Women into Work Discovery Programme is accredited by the Greater Manchester Open College Network, whilst other programmes will carry the accreditation relevant to the content, e.g. OCR New CLAIT. 9.30-3.30 Mon, Tue, Wed, Thur; 9.30-12.30 Friday. The top deck of the bus is a fully equipped training and resource area. All training is free and includes the core elements as outlined above. The majority of the bus staff are Asian and can speak all major Asian languages. Additionally, the bus offers the programmes with a specific bias, e.g. Childcare, ESOL, Enterprise. Programmes are constantly reviewed, evaluated and new areas developed to meet changing needs. Training can be accessed through various methods, either on-board or at other locations. Support for childcare is available either in the bus crèche or, financially. Guidance and support are underpinning features of the programmes and apart from people resources, the bus has a comprehensive range of books, tapes, computer programmes, directories and guides for women to use. Most training leads to an accreditation through the Greater Manchester Open College Network. Downstairs, there is a custom built crèche for the children of women in training.